Your PC is on a lot longer than it has to be. In the old days, consumers paid for software. Then open source came along and made many applications free. And now there's software you get paid to use. To help curb power consumption in California, Pacific Gas and Electric will give businesses and IT managers $15 for every computer with energy management software from companies like Verdiem, BigFix and 1e. Promisec (not the allergy medicine) is the latest to join the list. According to Lawrence Berkeley National Labs, 90% of desktops do not use power-management settings. In today's IT environment, nearly half the power of an average desktop PC is wasted as escaped heat. That's a lot of unnecessary waste, much of which is avoidable through proper power management. Benefits in having IT policies include cutting the electricity used by PCs by over 50%, saving $25 to $75 per PC annually (Verdiem puts the savings at $30 to $60 a year), and reducing office air-conditioning loads (that saves an additional $5 to $10 per PC annually, or $10 to $25 or more in warm climates). Starwood Hotels says it will save $1 million over three years after putting energy-throttling software from ScriptLogic on 13,000 employee desktops. 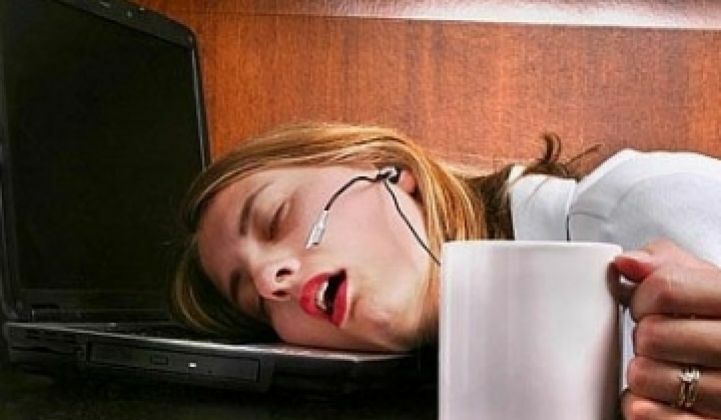 The Environmental Protection Agency (EPA) estimates that placing computers in 'sleep' mode slashes energy use by 60% to 70%. This could save enough electricity annually to power Vermont, New Hampshire and Maine, cut electricity bills by $2 billion, and reduce CO2 emissions by the equivalent of five million cars. The agency recommends placing computers in standby or hibernation mode after 30-60 minutes of inactivity, and putting monitors into sleep mode after five to 20 minutes of inactivity for even greater savings. PCs sold today comply with strict energy-saving standards, thanks to Energy Star, a joint project of the DoE (Department of Energy) and the EPA. Program-compliant computers and monitors can be programmed to automatically power down to low-power states when not in use. But that's not true of the installed base. PCs on average get refreshed every four to five years, with many churning for years longer. Promisec works remotely and automatically, enforcing power-management settings for all network nodes based on preset power configurations, according to Marc Brungardt, Executive Vice President of Operations at Promisec. Some of the key InnerSpace features that PG&E has taken a liking to include the program's ability to stop users from disabling the power-management features, something that's long been an obstacle to making energy-reduction practices stick. Since InnerSpace includes a reporting function, the software can let IT managers know who's trying to circumvent the company's larger green goals. According to Promisec estimates, companies that install its PC Power Management software will save $50 per PC per year in energy costs. Coupled with the PG&E rebate, it means that the project practically pays for itself right away, with big savings possible down the line. "It took us a year to finally be on their approved vendor list," said Brungardt. "But the benefits are clear and measurable. We can save customers $40 to $50 per PC, essentially at no end-cost. And it complements users' green applications." What helped Promisec to get on PG&E's list was the fact that last year, they established an agreement with the State of Texas that will allow InnerSpace to be used in every state agency, university and K-12 school. Promisec was the first software company of its size in history to achieve such a contract agreement with Texas; other players in this league are usually big companies like Microsoft and Oracle. The green aspect was one of Texas' primary considerations in acquiring Promisec's software, since it represented technology that could save money in difficult times. The state ran projections of the savings potential: around $40 million dollars per year, simply by switching computers to a lower power state or turning them off when not in use. InnerSpace can be configured for use on up to 500 PCs in less than an hour. "The power and money savings and the environmental impact are managed by this software. And this is the unique feature of the Promisec application. Other technologies that use the tools found on each computer are less efficient," Brungardt claimed. Despite the economic and environmental payoffs, industry experts say that more than 80% of companies have not adopted an endpoint power management strategy.